I have written previous articles about the proposed leases for the practices who occupy all or part of health centres, now owned by NHS Property Services Limited. Such practices do not occupy health centres by way of formal lease agreements, although there have been various efforts made in times gone by for leases to be implemented. 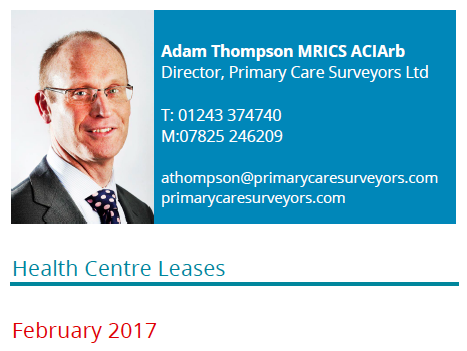 With the abolition of the PCTs and the properties being transferred to NHS Property Services Limited (NHSPS) it has always been the stated intention for a programme to be instigated to regularise the occupation of health centres by leases. In recent weeks e-mails have been received by practices commencing this programme. Attached to the e-mails are draft heads of terms and floor plans showing the accommodation allocated to the practices. Having reviewed the heads of terms, the proposed lease terms have both positive and negative connotations. The positive points include the lease being flexible and allowing the practice to terminate the lease in the event they decide to terminate their service contract. The onerous part of the lease is that it is for a term of 25 years, but with the practice paying for the external and structural parts of the property via a service charge. From advising practices who currently occupy health centres, it is well known that the service charges can be onerous and the liability to pay such a service charge for 25 years is likely to be prohibitive. Furthermore, the premises are generally dated in age and there is uncertainty as to the condition of the premises, therefore to be exposed to the liability to pay for such repairs and defects is, to my mind, too great a risk. Within the heads of terms there are numerous points that will need to be discussed and negotiated. The more consistency there is as to the areas to be rebutted, hopefully the more inclined NHSPS will be to soften their position. These negotiations are going to be interesting and will no doubt go on for a while. This needs to be considered against the GP forward view in which it states that for those practices who enter into leases by 31 October 2017, NHS England will reimburse Stamp Duty Land Tax (SDLT) costs in entering into a lease. Whilst this immediate incentive is tempting, I would caution against rushing into a lease too hastily to have your STLT reimbursed, which could pale into insignificance compared to the liability for a service charge over the term of the lease.